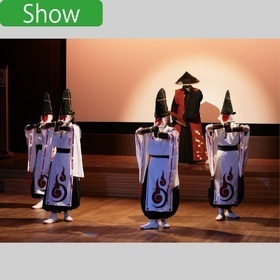 About MAHOROBA-SHU We are a Japanese dance team that was formed in 2002. We perform largely in Fukuoka, and our performances aim to express and convey the culture of Dazaifu and the tradition of the Heian era through dance. In addition to traditional Japanese music, the dance team also works in collaboration with other Japanese musicians to bring in the unique sounds of the Japanese drum and flute. Other than performing in the 60th Baekje Culture Festival in Korea, our team is also actively involved in a wide range of events in Japan. The uniqueness of our team lies in that it emphasizes the individuality of each dancer by adorning their faces with a satgat or mask with a unique style. This special feature of the masks accentuates the theme of each unique dance, where the dancers perform an array of movements and gestures including martial art forms to bring the audience an enthralling performance.